Bomb Cyclone. While the entire US East Cost was held hostage by a weather system that introduced us to new catchy meterological concepts such as bombogenesis, I hope that everybody is staying warm and safe. I wanted to wish all our readers a Happy 2018 and try to give an outlook of the New Year in epilepsy genetics. Here are three things in epilepsy genetics that will happen in 2018 – and three things that won’t. Bomb cyclone. 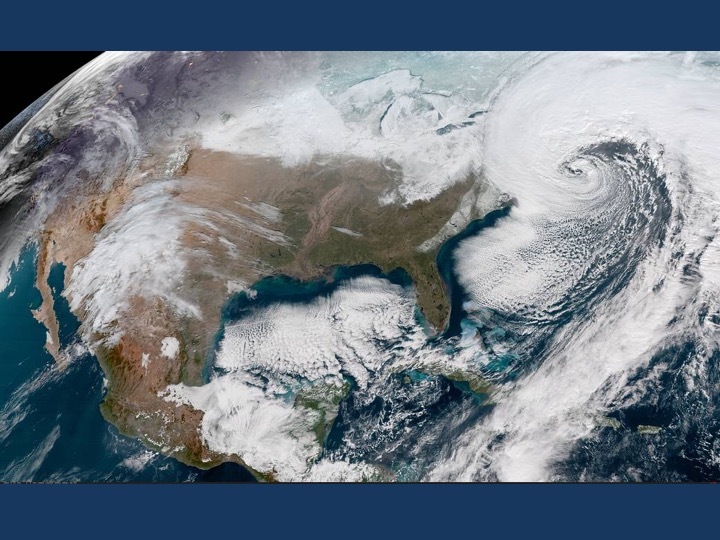 The weather system covering the US East Coast with snow and a record-setting cold. The unusually strong phenomenon made news outlets go into overdrive by outdoing each other with novel superlatives referring to the lowest temperature recorded in Philadelphia in a generation or weather that is as cold as Mars (Image by NASA https://www.nasa.gov/multimedia/imagegallery/iotd.html). When I look back at 2017 and ask myself what has impressed me the most clinically, I would emphasize the atypical phenotypes: milder presentations for seemingly severe genetic variants in neurodevelopmental genes, unusual neurological presentations for known disease entities, and unusual disease trajectories over time. As a clinician, I am fundamentally opposed to the idea that most genes for neurodevelopmental disorders results in a broad, undefined spectrum of neurological disorders and we are always on the lookout for novel phenotypic entities. My take-away from 2017 that we have only begun to understand the new phenotypic landscape that is opening up and is that our traditional boundaries may be shifting. 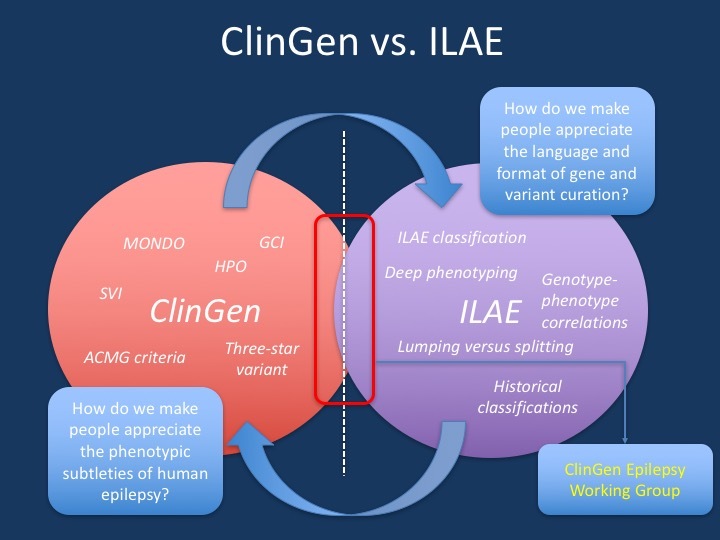 During our Special Interest Group at the American Epilepsy Congress (AES) in Washington, I used this slide to emphasize the emerging divide between the phenotypic language used in the clinical sphere and the language used in a diagnostic setting. While we typically think of epilepsy phenotypes with regards to the ILAE classification, this is not what most diagnostic laboratories use. Many diagnostic laboratories are involved in diagnostic testing of several diseases and increasingly used standardized vocabulary such as the Human Phenotype Ontology (HPO) for diagnostic purposes. We had initially developed the epilepsy-specific HPO terms within the first phase of our EuroEPINOMICS-RES project, but this concept has found little traction in the epilepsy field. Also, the ClinGen interface uses the MONDO disease ontology for disease classification that we’re currently aligning with our standard language in the epilepsy field. Take home message: we have to make sure that we don’t start talking in different diagnostic languages in 2018. 10,000 exomes? Just use your Google account to tap into the Cancer Genomic Cloud or possibly even some exomes on neurological disorders. Except that nobody is using these tools at the moment. While there was tremendous excitement for cloud-based platforms in the last two years, many of these tools have not gained the traction yet that was expected. Rather, we’re dealing with the downstream effects that we are realizing the start-up costs of using these tools that are often still limited to the major centers that host the bulk of the genetic data, anyway. What will happen in 2018? We will slowly accustom ourselves to large genetic data in the cloud and will develop a more mature view of what we can use this data for. The cloud is not the cure-all for all shortcoming in the genetics field, but another tool with advantages and disadvantages. Realizing the specific instances when such tools can be used, ranging from large-scale data mining to democratizing specific aspects of consortium-based research, will make them attractive for us in 2018. Don’t get me wrong, I would love to see the “ultimate handshake”, the convergence of imaging/EEG research and genetics. However, this will still be a problem of numbers in 2018. The major issue: genetics requires larger cohorts for the association approach and to overcome genomic noise. Imaging/EEG research, in contract, is deep phenotyping on individuals. Once we have a cohort of 1000+ patient with existing genetic and imaging/EEG data, we can start looking. Everything else is probably still underpowered and not achievable in 2018. As many of you already know, using information from electronic medical records in patients with known or presumed genetic epilepsies has become a major focus of our group. The ultimate goal is to overcome the phenotypic bottleneck that is still presenting one of the major hold-ups in epilepsy genetics. I am actually very excited by the idea that we can use readily available data in the medical records for computational and longitudinal phenotyping for concepts such as drug response, side effects, and developmental outcomes. In fact, within our GRIN collaboration, we might currently have one of the largest pediatric datasets, encompassing more than 1,000 “exome years” (available exomes x patient years in the electronic medical records). However, the more we handle the data, the more we realize that we have to be careful and rigorous when assessing some of the basic assumptions. Take genetic testing as an example – if we ask for the most significant findings in a genome-wide association studies without any correction, we’ll mainly find one thing: artefacts. Electronic medical records for computational phenotypic hold great promise, but this novel field requires some basic work. The big promise is the prospect of “scalability” – once the basic rules have been established, phenotyping can grow as exponentially as genetic testing – but 2018 will probably be reserved for doing some of the basic footwork. If Facebook can do it, why can’t we? Conceptually, it should be possible to use the already existing technology to use patient-derived data for improving our understanding of genetic epilepsies. This may be through patient-owned seizure diaries or through wearables. However, in 2017, I have grown slightly skeptical that a breakthrough on this area is on the horizon. I started out 2017 being quite excited that patient-owned seizure diaries will lead to an explosion of available data that will help us better understand epilepsy. Technically, the tools are available, but there is a remaining disconnect that we were not able to fully address. None of the tools that I am aware of has found a major traction in the patient community. Please don’t understand me wrong – I’m not blaming the community, I’m blaming the tools. The existing tools and providers have not been able to sufficiently convince the patient community that data sharing is both safe and meaningful, which leaves a tremendous opportunity to improve our understanding of genetic epilepsies untapped. I still believe that if we are able to capture some of the dynamics on social media such as Facebook for scientific purposes, we may learn about aspects of genetic epilepsies that we’re currently oblivious to. However, I don’t think that this will be an achievable goal for 2018 yet.